The Party for Socialism and Liberation has come out with an anti-imperialist position about this whole KONY 2012 campaign, which with its first class promotion, I will assume "needs no introduction." The PSL position isn't wrong, as far as it goes. The problem is that it doesn't go very far. It is over simplistic whereas the real world is much more nuanced. They hear "oil" and they think "That's it!" and they don't look much beyond that when there is so much more than that involved. Their refusal to comprehend just what is going on in Syria now means they don't get the obvious contradiction that while Assad is presently killing hundreds a day, he just started shelling a second Syrian city and there are reports that he is now using helicopter gunships, a worldwide campaign to bring to justice another war criminal, but one that hasn't been in Uganda for 6 years, is stealing all the headlines. Also their faulty view of Mummar Qaddafi and his role in Africa and their failure to understand what is happening in Libya have not helped them understand why US Special Forces landed in Uganda just about the time Qaddafi was being killed. PSL claims to be a Marxist organization so I will begin by looking at their statement and its limitations before giving my own Marxist views on the phenomenon known as KONY 2012 because I don't believe Marxists can give good guidance to the struggle with simple "one size fits all" answers. We must be able to understand and explain things in detail and from all sides. It goes without saying that imperialist harbor a predatory interest in any country that has oil. That is not rocket science nor does it do grace to Karl Marx. It is also a long, long way from explaining why we are suddenly all talking about KONY 2012. U.S. imperialist interests and humanitarian interests are mutually exclusive. This mechanistic view also shaped their "line" on Libya. It is based on their emotional attitude towards the US and has nothing to do with Libya or Uganda or the concrete conditions of the situation in either case. Chris Blattman, a political scientist at Yale, has written on the topic of IC’s programming: “There’s also something inherently misleading, naive, maybe even dangerous, about the idea of rescuing children or saving of Africa. […] It hints uncomfortably of the White Man’s Burden." But overall I think they fail to explain what is happening now and why, and they fall far short of what should pass as a reasonable Marxist analysis. But I agree with them that "There is much to be said on this topic" so let me begin were they left off by telling you, from a Marxist perspective, what I think is going on with KONY 2012 and why. While oil and other imperialist concerns play a role, I think the main driving force behind KONY 2012 is Barack Obama's need to be re-elected in 2012. That is why Joseph Kony, a war criminal and mass murderer who has been on the loose for 26 years suddenly needs to be "brought to justice" in 2012. What makes KONY 2012 have any real chance of success in its stated goal is the hundred US Special Forces deployed to Uganda in October 2011 and only Obama had the power to order that mission. PSL and many of the other "anti-interventionist" that campaigned against US intervention in Libya are now vigorously campaigning against US intervention in Syria and this time I think they will be successful because I don't think Obama has any intention of doing anything substantial to stop Assad's bloodletting. I don't think he plans to start a war with Iran either, or sanction one started by Israel, at least not until after the election. The blow back, both in economic and human terms just might be too high and upset his chances of being re-elected. To quote a famous line I heard somewhere "He wants what every first term president wants, he wants a second term." This too is the imperialist way. At this point it time, getting re-elected is foremost in Obama's mind that you can bet, that has a lot more to do with why he ordered 100 USSF into Uganda now than any long term imperialist interest in more oil. So while Obama probably isn't planning any big military actions between now and the election, as those could be too iffy from the re-election standpoint, and even though he has Bin Laden's scalp under his belt, he probably needs the insurance of something like an "October surprise" on the military front to shore up his "right flank" as he faces the Republican challenge in the fall. Something like another Ben Laden take down that he could pull out of his hat would be nice. Joseph Kony has a history of atrocities that goes back 26 years and is one man that seems to have no redeeming qualities. He was the first person ever indicted by the ICC and he hasn't been in Uganda for 6 years but he is still in the region. His child army, which once number 3000 is now down to less that 300 children so a 100 well equip US Special Forces should be able to defeat them easily. The deployment to Uganda probably satisfied a pentagon desire to see US "boots on the ground" in Africa after they couldn't get their eggs hatched in Libya, but the decision to send them there was the president's. "Unless the government knows the people care, the mission will be canceled." That is the laugh line in an otherwise very serious video. Since when did the US military cancel a mission because of a lack of public support? Where was the mass outpouring of public support for Vietnam, Iraq and Afghanistan? Although they come from what could be called a "white, liberal do-good perspective", Invisible Children seems sincere in their desire to rid the world of Kony. They have been at it since 2004, here is article about them from the Nation in 2006. They are principally filmmakers that see films about Kony as their major tool. Accordingly, most of the money they have collected has gone to equipment, travel, salaries and other expenses, with only about a third going to people in Uganda. Filmmaker Jason Russell's nonprofit group, Invisible Children, tapped 12 influential policy makers and 20 celebrities with popular Twitter accounts, including Oprah Winfrey and Angelina Jolie, to spread the video. Since then, the company owned by powerful producer Harvey Weinstein has contacted Russell to buy the film. Want to venture a guess who all these people will be supporting in the 2012 election? Regardless of whether you agree with the campaign's content, do you think there might be something to learn from their methods? Would you like to have another 26 million people turn out to vote Democratic in November? Not to make too fine a point. I would also add to this the observations of Teddy Ruge on AJE that this is a US organization that is calling for US military intervention in Africa, that it has no African voices, that these atrocities aren't news in Uganda, Kony hasn't been there for six year and now people have largely put this in the past and are about getting on with their lives. There are, of course, other reasons behind this KONY 2012 campaign. The atrocities being committed by Assad in Syria is one. Assad has five times the air defense Qaddafi had and a lot less oil so the Syrian people are just SOL when it comes to NATO "humanitarian" intervention. Still it is embarrassing for the self-proclaimed "cops of the world" to appear powerless in the face of Assad's murderous rampages. The KONY 2012 campaign shifts the publics attention to a war criminal that can more easily be handled. I was surprise to see that on NBC Nightly News, Friday, Kony's past war crimes received a lot more air time than Assad's current and on-going ones. They said they were going to broadcast from Uganda on Monday, so expect this to continue for a while. Another very important reason for this KONY 2012 campaign and the US military intervention it supports is the need for the imperialist to exercise their muscles in Africa more directly now that they no longer have Mummar Qaddafi creating chaos on the continent and helping to keep the people there down. Idi Amin came to power with the support of Britain and Israel because they thought he was uneducated enough to be used by them. Amin, however, turned against his sponsors when they refused to sell him guns to fight Tanzania. Unfortunately, Col. Muammar Gaddafi, without getting enough information about Uganda, jumped in to support Idi Amin. Amin killed a lot of people extra-judiciary and Gaddafi was identified with these mistakes. In 1972 and 1979, Gaddafi sent Libyan troops to defend Idi Amin when we attacked him. I remember a Libyan Tupolev 22 bomber trying to bomb us in Mbarara in 1979. Many Libyan militias were captured and repatriated to Libya by Tanzania. 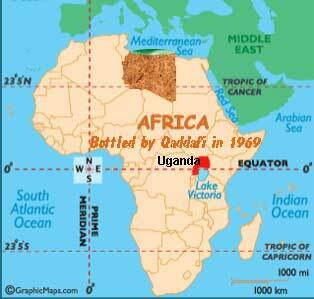 This was a big mistake by Gaddafi and a direct aggression against the people of Uganda and East Africa. The second big mistake by Gaddafi was his position vis-à-vis the African Union (AU) Continental Government “now”. Since 1999, he has been pushing this position. We should, instead, aim at the Economic Community of Africa and, where possible, also aim at Regional Federations. Col. Gaddafi would not relent. He would not respect the rules of the AU. Something that has been covered by previous meetings would be resurrected by Gaddafi. He would ‘overrule’ a decision taken by all other African Heads of State. Some of us were forced to come out and oppose his wrong position and, working with others, we repeatedly defeated his illogical position. The third mistake has been the tendency by Col. Gaddafi to interfere in the internal affairs of many African countries using the little money Libya has compared to those countries. One blatant example was his involvement with cultural leaders of Black Africa – kings, chiefs, etc. Since the political leaders of Africa had refused to back his project of an African Government, Gaddafi, incredibly, thought that he could by-pass them and work with these kings to implement his wishes. I warned Gaddafi in Addis Ababa that action would be taken against any Ugandan king that involved himself in politics because it was against our Constitution. You see, now that they don't have Qaddafi to kick Africa around for them, they will have to take a much more active and direct role in "managing" Africa themselves. So you see, the success of the Libyan revolution is likely to result in more NATO "boots on the ground" in Africa, as the anti-interventionists predicted, just not in Libya, as the anti-interventionists predicted. The non-profit organization Invisible Children and its viral video Kony 2012, which has become an international sensation in the past couple of weeks, is continuing to stir controversy. Not only have critics raised questions surrounding Invisible Children and its methodologies, but numerous reports are now verifying that local Ugandans too are in fact angry about the campaign. The non-profit African Youth Initiative Network (AYINET), which calls itself an organization to help rehabilitate victims of war, organized a public screening in the town of Lira in northern Uganda on Tuesday night. Northern Uganda was one of the regions worst affected by Joseph Kony's rebel group, the Lord's Resistance Army (LRA). While the Kony 2012 film has become the most viral video in history, this was the first time that most Ugandans in Uganda — the majority of whom have no access to the internet — saw the film firsthand. The reactions featured in this video report on the screening are a far cry from the outburst of support that pummeled through Western nations. One local Ugandan featured in the video, an LRA survivor who only had one arm due to the other being blown off in a land mine, seemed pained at some of Invisible Children's campaign strategies. "If people in those countries care about us, they will not wear t-shirts of Joseph Kony for any reason," he said. "That would celebrate our suffering." Another local Ugandan stated, "We wanted to see our local people who are killed. So these are all white men, different from northern Uganda." "What has angered people is that the video is about a white person, not about the victims," said Emmy Okello, a radio journalist in Lira featured in another report. "All of them came here hoping to see video that tells their story." These sentiments echo other crowd-sourced views surfacing from Uganda. According to reports, the reactions in Lira erupted into stone-throwing. As a result of this aggresion, AYINET has postponed further screenings of the video in Uganda indefinitely. Meanwhile, Invisible Children has not been indifferent to the Kony 2012 backlash. Earlier this week, the organization released a video responding to its critics. But while it defends its marketing and financial tactics, it doesn't address the resentment of Ugandans at seeing "white people" tell their story. Indeed, like the original Kony 2012 video, it's told from a Western, rather than Ugandan, perspective. What do you think of these latest developments in the Kony 2012 controversy? Should Ugandan reactions prompt another video response from Invisible Children? Let us know in the comments. Sat Mar 24, 2012 at 10:06 PM PT: The KONY2012 video has been viewed more than 85 million times and now the African Union is deploying a military force of 5,000 to hunt down Joseph Kony in Uganda. Like the special team tasked with tracking down Butch Cassidy and the Sundance Kid they have announced that they will be there for as long as it takes to capture or kill Kony. Kony is believed to be in the Central African Republic. The US already has a hundred special forces soldiers hunting Kony and the US will also be strongly supporting this AU effort. See BCC: African Union force steps up hunt for Joseph Kony for more. The push is on big time to bag Kony before November IMHO.